The most common issue plaguing the average American comes down to the ratio of debt VS savings. The people of this country are faced with stagnating wages and the inability to find better paying jobs. The crash and impending housing bubble has made it difficult for people to build wealth through more traditional means. In recent months many people are looking at their debt VS savings ratio and wondering what the next move is. What should your next move be? What is the average standing? The poll was taken on many American families to see how they were faring as far as monthly and yearly saving within the last 12 months. A staggering 2/3 of those that responded that they were seeing little to no improvement in their savings over the last year, while only 1/3 of those that responded were doing even slightly better than they were a year ago. However, the same 2/3 responded that their debt had remained the same or increased in the same amount of time. The poll asked many different families from varying income levels. A common issue among most that responded found that the inability to save came mainly from the inability to decrease monthly spending. This issue with cutting costs has only added to the problems these families are facing but not being able to save the difference. Only 1/3 of American families are nationally recognized as living within their means, and by no means, is it easy. The bulk majority who say that they are saving more than they are spending, have carefully analyzed their financial situation and often had to make drastic changes to their lifestyle. Does higher income mean better savings? According to the poll, actually no. Since the income brackets have changed since the start of the great recession, lower income, middle income, and upper income have been drastically redesigned. As of last year lower-income Americans are considered to be those with a total annual income of between $25,000 and $50,000 dollars per year. Middle income has been redesigned to encompass those who make between $50,000 and $100,000 dollars annually per year. What was found was that those who made almost double what their counterparts and the results were almost identical. Those that made an average of $50,000 to $100,000 a year weren’t saving any more than those in the lower income bracket. What this means is that those who were making a significant amount more per year couldn’t produce any extra padding in their savings accounts. Only one out of five families is able to save more than they are spending in the higher income bracket. While that is less than the percentage of lower income families who are living beyond their means, it is still significantly higher than those with a higher income. What is even more disturbing is while these families tend to be living paycheck to paycheck, with savings being drained or nonexistent at all, so too did the lack of retirement savings. Most of the families when asked how they had paid for emergency spending or planned to pay for an emergency, the answer was often attributed to credit cards. That is always a red flag when credit cards are an acceptable way out. How can I save more and spend less? 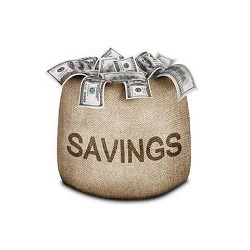 Careful planning is the key to saving more than you are spending. While most American families cannot seem to move beyond the rut they are currently locked into, that doesn’t mean that you or your family has to follow suit. In fact most Americans may look objectively at their monthly and yearly budgets. But understanding the fundamentals of saving will then trickle down into how you spend your money more wisely. In the past few years we have noticed a change in buying trends. More and more families are clipping coupons. Brand names may be long time industry trusted products, but name brands are selling more. Lowering the grocery bill, car pooling to work, and refining your overall spending habits can all contribute to a better more stable financial future. If anything from high school still sticks out in my own memory, it is Newton’s Third Law: ” For every action there is an equal and opposite reaction.” While that law primarily applies to physics, the same concept can be transplanted into any aspect of life, especially financial. When it comes to debt VS savings, it is important to remember that one action will affect the other. 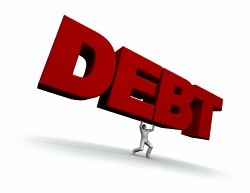 Therefore, if you can cut your costs and spending your debt will begin to dissolve. In turn while you debt starts to shrink, the extra money that is no longer going out of the door can now be reassigned into emergency funding or retirement funding. By mastering this concept you can set yourself apart from the average American families, and change the course of your debt and savings.